The Community College Research Center conducts research on a wide variety of issues affecting two-year colleges nationwide. As a route to higher education for well over a third (40%) of undergraduates in the U.S., community colleges are for many an important gateway to improved opportunities and earning potential. Their current research about student completion and transfer rates reveals a couple of interesting trends concerning students’ pathways through postsecondary education. For example, although 80% of students who enter community college intend to transfer to a four-year program in order to complete a bachelor’s degree, only a quarter (25%) of them actually transfer within 5 years of starting school. 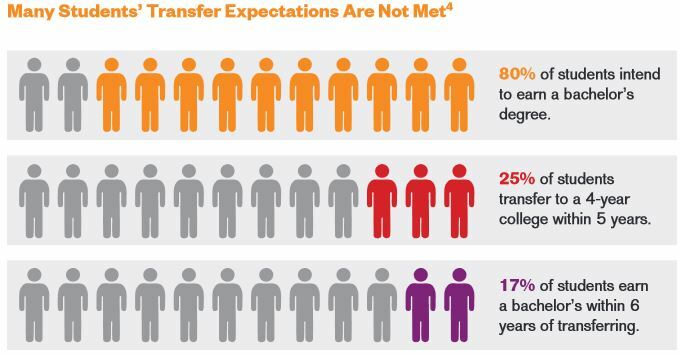 In addition to this, while nearly three-quarters (72%) of transfers end up in public institutions, a disproportionate amount of minorities (Black and Hispanic) and under-performing students end up in for-profit colleges when they transfer, and are less likely to complete their bachelor’s degree. A finding that may come as surprising is that it’s not the increased rigor and expectations of four-year programs that is the primary reason causing transfer students to stall, but rather the loss of credits due to transferring. With all of this said, the students who do transfer successfully reap pretty significant rewards, saving significant amounts of money on their lower division coursework and seeing essentially the same income benefits as four-year institution natives. Since community colleges are such significant gateways to higher education for a large proportion of the country’s population, and especially the underserved, libraries at two-year institutions represent important points of contact that can help students gain the skills they need to achieve a degree, and the knowledge necessary for successful transfer. Additionally, libraries at four-year institutions should be aware of the difficulties transfers face, and should strive to meet the unique needs of this group. You can read the full report on college transfer students here, and find other current projects from the Community College Research Center here. We know now that strong information literacy skills are very important in both the academic and work environments. In a new study published in College & Research Libraries, Victoria Raish and Emily Rimlaud seek, through a nation-wide survey of employers, to find out employers’ perceptions of critical information skills and their potential acceptance of a new technological measure of student skills, called digital badges. Digital badges, as described by the authors, are a digital representation of an ability gained that “certifies skills at a more granular level.” The authors argue that this method of representing accumulated knowledge of various literacy skills could prevent the uneven nature of “one-shot” instruction provided by professors or librarians by establishing core competencies and identifying gaps. The survey asked participants to rate a variety of critical information literacy skills from the employer perspective. It was found that three sets of skills had a statistically significant difference from the others, and were thus deemed the most important to employers. These were innovation, critical thinking and using quality information, and collaboration. In addition to this, nearly a quarter (24%) of employers indicated that grades and GPA do not correlate with preparedness for the workplace. Universities and academic libraries in particular need to ensure that their information literacy curriculum at least closely matches the most common expectations students will meet when entering the workforce. This survey indicates some important areas of emphasis, as well as the potential that digital badges might offer for student success. Over one-third (33%) of participants said that digital badges would definitely be useful when evaluating applicants, and nearly the whole remainder (62%) said they might be useful, but needed to learn more. However these skills are represented, every indicator suggests that information literacy instruction needs to become a core function of higher education, not peripheral training. To learn more about the survey, current findings about information literacy instruction in higher education, and how digital badges can serve as a new measure for student skill, interest, and ability, read the study in full here. Library Journal has released the findings from their 2015 Placement & Salaries Survey, which tracks yearly trends in employment among newly graduated MLIS students. In 2014, out of 4,331 estimated library school graduates, 32% participated in Library Journal’s survey. The results show an overall increase in full-time employment among new graduates, as well as steadily increasing salaries, though many new librarians are frustrated at the rigor of the application process and the number of available entry-level positions that actually require an MLIS degree. The number of new library school graduates with full-time employment increased from 70% in 2013 to 83% in 2014. What’s more, those new graduates are earning even more starting off; starting salaries increased 2.9% from 2013, to $46,987. Women’s salaries increased slightly more than men’s as well, which represents a modest gain in closing the gender wage gap, though men continue to earn 14.9% more than women. You can peruse all of Library Journal’s data on salaries and placement here. You don’t have to be a graphic designer to present your library statistics in a way that effectively communicates value. In this session, straight from the 2015 Research Institute for Public Libraries (RIPL), you’ll learn quick and easy tips for displaying your statistics in a way that tells a powerful story about your library, whether your data visualization aspirations consist of adding a few Excel charts to a board report or designing a complex infographic for your website. As part of this session, several free and/or low-cost infographic creation software tools will be demonstrated. A new nationwide study by Library Journal, in partnership with Gale, examines faculty and academic librarian perceptions of the services offered by academic libraries, and the results are mixed. Nearly nine out of ten faculty (87%) feels that the academic library is important for providing resources for their own and their students’ research. However, academic librarians and faculty had different views on what services are most important and whether communication is adequate between faculty and librarians. As far as services go, librarians and faculty do agree that the central function of academic libraries is information literacy instruction and research consultation for students. Yet librarians tended to rate their achievement in these areas much higher than faculty did. On the other hand, faculty are more likely to rate librarians higher in terms of stretch services. Well over half (61%) of faculty, for example, rated repository services as very important or essential, compared to just half of librarians. Faculty also rated services such as text and data mining, and research grant management, higher than librarians did. Communication seems to be the biggest barrier to faculty and academic librarians seeing eye to eye, though. Essentially all academic librarians in the study (98%) thought there could be better communication between the two parties, compared to less than half (45%) of faculty surveyed who felt the same. Busy schedules and a lack of easy ways to foster in-person contact were the most cited reasons for a lack of communication. 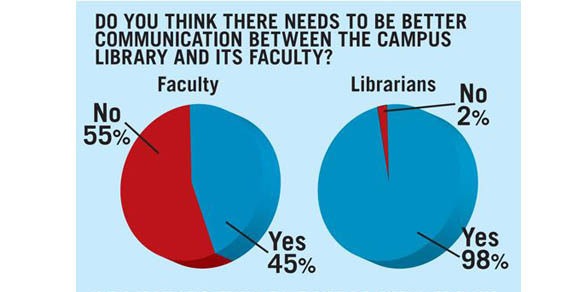 Over a quarter (27%) of faculty simply felt that there was “no need” to communicate with librarians. Results from this survey seem to indicate that libraries and their services are still perceived as very important to academic institutions. The challenges that academic libraries will face, though, appear to be balancing the services needed by all campus stakeholders, including students, faculty, and graduate students, while forging effective methods of communication in busy and technology-saturated environments. While the library job market seems to be improving, there is always room for more data! In the newest College & Research Libraries, two academic librarians did a content analysis of the American Library Association’s (ALA) JobLIST and the Association of Research Libraries’ (ARL) Job Announcements to capture the academic library job market in 2011, then compared the results to 1996 and 1988. While at this point the 2011 data is a bit stale, the trend information can be useful to those in the job market or hiring. The researchers looked at the number, types and titles, qualifications/skills, salary, and locations of positions posted from January 1–December 31, 2011. One surprise finding: 33 different library job titles were found in the 2011 study, up from 22 in 1996 and 12 in 1988. The researchers speculate the increase is because of new emerging technologies and e-resources management shifts. Public services positions dominated in 2011 with 57% of all postings, while technical services trailed with 27% and electronic services with 15%. The geographic location of these positions has stayed fairly constant, with the North Atlantic region slightly winning out with 29% of announcements, compared to 26% in West & Southwest, 24% in Southeast, and 22% in the Great Lakes & Plains. As might be expected, the 2011 study found a 24% increase in the percentage of job postings requesting computer skills compared to 1996, and more than 100% increase compared to 1988. A majority of positions (60%) required previous work experience, 14% preferred work experience, a quarter didn’t specify, and just 2% classified themselves as entry-level. And for those currently on the job market, take note: Just 35% of all job announcements listed salary information. Read more about the academic library job market in the full report here. And check out our analysis of academic librarian salaries and of our own popular Library Jobline. With the popularity of e-books in public libraries surging, many academic libraries are still tentatively acquiring e-book collections while debating how they might add to or detract from student research methods. Julie Gilbert and Barbara Fister of Gustavus Adolphus College have published an article in College & Research Libraries that tackles this very question though a survey of 417 students. The aim of their study is to investigate the potential impact of e-books on students reading habits through their current e-book use and their perception of how e-books might alter their reading behaviors in the future. Even though close to half (42%) of students surveyed already have either e-reader devices or e-reading software on their mobile device or computer, the most prominent use for e-readers was for fiction (84%) and recreational reading rather than research (20%). Perhaps not surprisingly, more than half (56%) of the most frequent visitors to the library said they would be likely to use e-books provided by the library, compared to only a third of those who seldom or never visit the library. This, along with the finding that students who already have e-readers are more likely to use the library for non-research purposes, even for print materials, suggests that those most open to e-books are already the most eager readers. 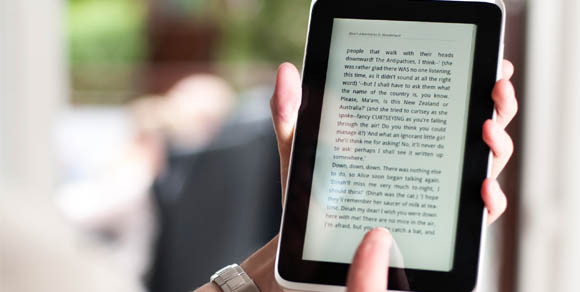 The survey respondents appeared to be split on their feelings about the ease of e-books. A little more than a third (38%) said e-books would make research easier, almost a third (32%) said e-books would make research more difficult, and nearly the same amount (30%) were unsure. The most cited benefit of e-books was their portability and ease of use, and those who preferred print often did so because it was familiar, as well as easier to flip back and forth between several print books while researching. Preference of e-books was also highly variable depending on the survey respondents’ major. Natural Sciences and Business students were much more likely than those in the Arts and Humanities to embrace research in electronic format. So, it seems that e-books are gaining ground as a viable format for research to some, but they are still primarily seen as most useful for recreational reading or part of an increasingly diverse mixture of research methods. You can peruse the full article, available via Open Access by College and Research Libraries, here. Recently, we posted results from ALA’s 2015 State of America’s Libraries Report about how public libraries are transforming into more digitally inclusive environments in order to better serve the needs of current and future patrons. Public libraries are not the only kind of library undergoing major transformations, however. ALA’s assessment of academic libraries found that although few libraries have seen increases in funding, many budgets have been re-allocated towards repurposing library space, migrating collections, and increasing staff focus on digital resources. 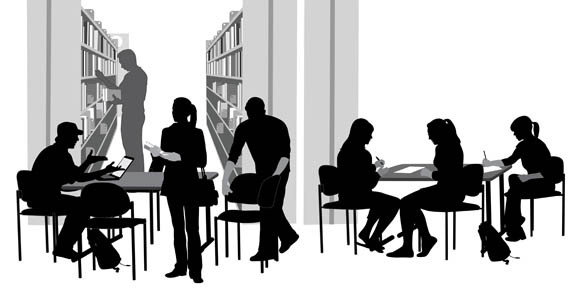 Almost two-thirds (63%) of academic libraries responded that they have found new ways to provide space in the last 3 years, including writing/tutoring centers, quiet study areas, and technology spaces. These transformational changes seem to have only just begun, too. The academic libraries also reported whether or not they planned on major changes to their library space in the next 5 years, and found that almost four-fifths (79%) of doctoral/research institutions were planning such changes, along with just over two-thirds (69%) of comprehensive institutions, just under two-thirds (65%) of baccalaureate schools, and close to half (45%) of associate-granting institutions. While academic libraries undergoing major increases or changes in space are hoping for significant increases in usage, initial responses indicate that the libraries are still considered extremely valuable to the academic community. Well over half (59%) of chief academic officers rated library resources as “very effective” – achieving a higher rating than many other campus resources. According to the ALA report, it appears that many academic libraries are well on their way to adjusting to shifting information environments. Want to know more? Check out the full report detailing school, academic, and public library trends here. For our popular library job posting website, Library Jobline, 2014 was a spectacular year! In our newest Fast Facts report, we report a total of 615 jobs were posted in 2014—the most ever since we launched the service in 2007—and up a whopping 170% since 2009, the lowest year for job posts in the middle of the recession. Average wages also hit new highs for posts requiring ($25.31 per hour) or preferring ($24.45 per hour) the MLIS degree. Library Jobline also became an increasingly national tool. In 2014, we had the most-ever posts for positions located outside Colorado, with the year-end picture split nearly evenly between Colorado (51%) and other states (49%). With more than 600 job seekers and more than 130 employers added in 2014 alone, jobs posted on Library Jobline also reached a wider audience. In fact, we sent the most emails ever—more than 617,000—about new job posts, and job posts were viewed nearly 430,000 times. Are you hiring at your library? In the library job market yourself? Sign up for Library Jobline as an employer or jobseeker. Jobseekers can tell us what jobs they’re interested in and get emails sent straight to their inbox whenever new posts meet their criteria. And employers can reach more than 3,500 jobseekers and more than 600 followers on Twitter @libraryjobline. Survey results from a in a semiannual study conducted by market-research firm Student Monitor show nearly two-thirds of 1,200 college students surveyed were satisfied with their libraries on campus, with more than a third (35%) saying they were “very satisfied.” Upperclassmen, females, and students who lived on campus reported higher satisfaction levels than their younger, male, and off-campus colleagues. Almost all (92%) of this group of college students also said they prefer doing research in digital format, but a solid chunk (about 40% depending on the activity) still prefer print when reading, studying, or taking notes for class. About a quarter (26%) said they’ve purchased an e-textbook, and just 10% ever used an e-textbook in high school. Just over 1 in 4 (26%) used Twitter while a whopping 90% used Facebook and 64% used Instagram. The researchers asked students to rate their experiences with various aspects of college life, including the computer lab, bookstore, dining services, housing, financial aid, and more. As part of a semiannual study, the results also show ratings over time, from fall to spring semester. According to a managing partner from Student Monitor, libraries consistently rise to the top of the value ratings while housing, textbook costs, and campus dining tend to fall to the bottom. Read more about this study via Library Journal and The Chronicle of Higher Education. For more context, check out our previous coverage of Pew’s research on young Americans’ perceptions of public libraries.